It has taken me just over a year to finally edit a video and write about a life-changing experience I had in February 2017. The time is now right to report on that. 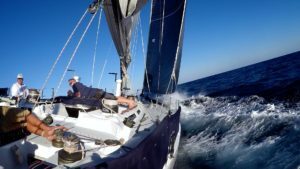 This blog and video attempt to highlight the beauty of sailing a fantastic boat like Merrythought in challenging seas, while celebrating the courage of eight men who survived a near tragic event at sea, hundreds of miles from the nearest land — February 19, 2018. I have sailed with my dear friend, Michael Peacock on his lovely 62 ft. racing cruiser sailboat, Merrythought, before. 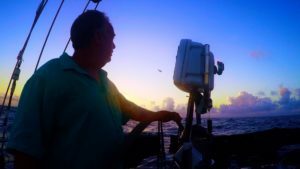 In May, 2014 we sailed from Antigua in the Caribbean to St. Petersburg Florida in what was an exhilarating 10-day adventure sailing “blue water,” as sailors call the open ocean. Click on the thumbnail photo for a short trailer of that adventure. 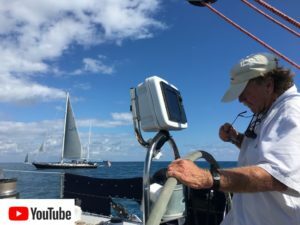 A full 23-minute video, Merrythought –Sailing with Michael Peacock, Antigua to St. Petersburgh, May 2014 is available on my YouTube Sailing Playlist. In February 2017, I joined skipper/owner, Michael Peacock and his crew on the beautiful 62 ft. aluminum racing cruiser, Merrythought. 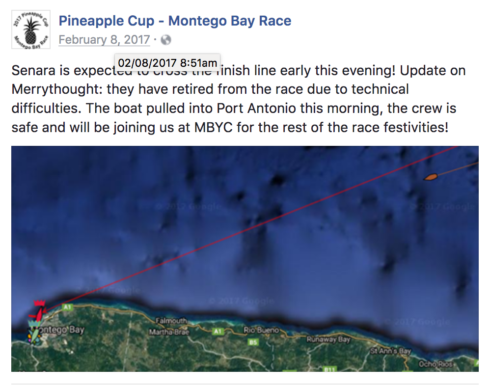 We were to sail in the annual Pineapple Cup sailboat race from Miami, Florida to Montego Bay, Jamaica. On February 5, 2017, we left Miami and were first to cross the starting line in very light wind. We had an experienced crew of seven; I made up the eighth. 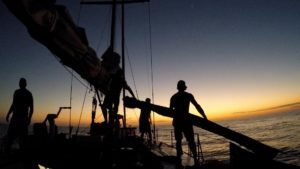 I was the only crew member without extensive professional sailing experience, although I have done a few blue water voyages, spent a couple of years in the South African Navy before college, and enjoy sailing my own Hobie Cat in Belize each year. Mike Peacock has owned and has been sailing and racing ocean-going sailboats most of his life. 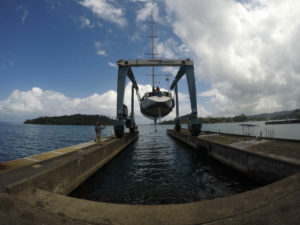 Each crew member had extensive experience, Mike Haber with a lifetime on the water, and Rusty Nicholson, Sean Harr, Colin Cameron, Jordan Peacock, and Christian Graff, all with extensive experience as professional crew on sailboats. I had full confidence in this excellent collection of sailors! Knowing the grace, speed, and historical record of this beautiful boat, we felt we had a very good chanc e to do well in this race. Merrythought won it in 1991 in 5 days, 20 hours. By sundown the wind had come up, and continued to strengthen throughout the night. For three days we had some amazing sailing, making excellent time. Then, in the early hours of the fourth day, in the pitch-black, dark, moonless night in heavy seas, near-disaster struck. At 02 AM the boat ran aground on a rock outcropping. After we made it to Jamaica, I wrote the following email to my family. Jessica and Dan and Gavin and Lolly in Chicago, Thomas in Vietnam, Yuki and Ryusei in Japan, and Katie traveling in Japan, Myanmar, and Vietnam. I was impressed with how at that moment we were scattered around the earth, but how an experience such as this made me feel a bond with my family stronger than I could comprehend. 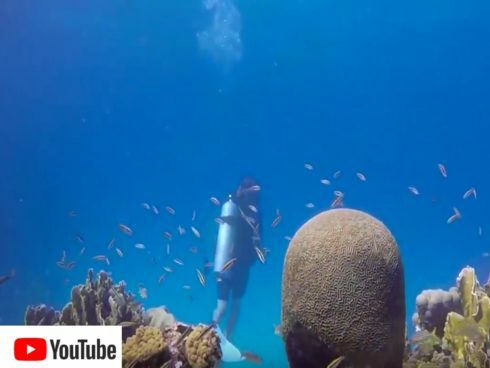 “So this is how it ends,” was the first thought that went through my mind as I was thrown out of my bunk in the middle of the night with deafening scraping noises as our sailboat ran full speed into a rock formation in the Windward Passage between Haiti and Cuba. The second thought was one of immense gratitude. At that moment I felt that if this were the end, I am grateful. And an amazing peace and calm came over me. There is so much depth to an experience such as I this; so many emotions. And I miss you all so deeply. This was a serious accident. On the third night, early morning of the fourth day, just after skipper/owner Mike Peacock and I went off watch at midnight, having just fallen asleep in my bunk (our next watch was at 4 AM; one only can sleep two to three hours at a time) I was jolted clear out of my bunk as our boat hit a huge rock outcropping in the Windward Passage between Cuba and Haiti. It was a major crisis with the danger that the boat would sink. With more than 200 miles to go. I grabbed my passport from my backpack and stuck it in my pants pocket. “That way they can identify the body,” I thought, as I hastily put on the ever-present life jacket. I scrambled up the ladder after Mike and climbed through the hatch onto the mid-deck. As I clipped the tether of the life jacket onto a railing I saw the dangerous situation we were in: sails tearing from the weight of the waves breaking over the boat turning the boat almost on its side, the keel stuck in the rocks; the boat being pounded onto the rocks which were barely visible in the glow of Merrythought’s running lights in the black, moonless night. The crisis worsened as the boat continued to be lifted, just to be thrown onto the rocks again. In a flurry of efficiency the crew hauled all the sails down as quickly as possible, with the next wave lifting the boat even higher. Why is the boat still in one piece? No boat could withstand this pounding without getting demolished on the rock! Through this all, I was amazed at my own calm, the clarity in my mind, and the sense of acceptance that flooded over me. I was so very impressed with skipper Mike Peacock as he calmly continued the MAYDAY! calls on the boat’s radio, trying to reach the Coast Guard unit located in El Salvador while calmly barking out orders of what needed to be done to protect lives and the boat. There was nothing else to do but try to deploy the life raft, many miles from the nearest land, the West coast of Cuba. “Prepare the life raft. Be ready to abandon ship!” ordered Mike. “MAYDAY, MAYDAY” he continued to call on the radio. These are not the words one wants to hear on a dark, stormy night at sea! Mike continued to engage the engine, the boat lifting in the huge waves, many times coming so perilously close to capsizing, and then being slammed down onto the rock with amazing force. Everyone, with life jackets on and harness tethers clipped to the boat, was holding on for dear life. Launching a life raft on the lee side of the boat (on the weather side of these rocks) would be suicidal, as it would be ripped to shreds. And likely the boat could kill a few of us anyway as it would be thrown on top us. So the decision was to stay with the boat and hopefully a Coast Guard helicopter could reach us before it was too late. I was amazed at the calm and efficiency of everyone on board, including yours truly. It was as if everything suddenly moved in slow motion. Our vision was clear, our focus intense, as we continued to try to save the boat. Not a person of this brave crew panicked; instead everyone calmly and efficiently worked to save the boat! I thought about my life and privileges in nano-second flashes. I realized that if I survive, my life needs to be different, making a difference in the lives of others on a much greater scale than hitherto. And even as at that moment there was great uncertainty about our hope of survival, the love and faithfulness to my family became an immense, re-affirmed commitment. Suddenly a huge wave lifted the boat. Mike fired the engine in reverse, then forward, and the boat actually lifted off the rocks holding it. It slowly turned to starboard, and as if in a dream, a miracle, we were afloat and free from the rocks. As the boat slowly moved away from the rocks everyone jumped into action, looking for the major leaks which would certainly sink the boat. Amazingly, there was only one serious leak. The crew immediately went to work to stem the flow as best as they could. A lot of “McGyver stuff” went on as the boat’s water pumps were engaged, electric wires stripped to rig an extra pump to try to stay ahead of the water entering the boat from a tear in the bow. Merrythought is an aluminum boat, the hull plates would bend and stretch some, but only one seam actually separated. If she were a fiberglass boat she would have been shredded on those rocks. While going through the rest of the boat carefully, we could hear the faint thud-thud -thud of a helicopter coming over the horizon. About two hours after the accident a U.S. Coast Guard helicopter arrived. Of course, there was no moon and it was still pitch black dark. Until daybreak this welcome helicopter hovered above and circled around us, their huge lights providing welcome light to help us continue our assessment of Merrythought. After assuring the officers that the boat seemed to be structurally okay, and we only had a spurt of water entering the boat from the starboard bow, they lowered a very large gas-driven water pump in an orange waterproof case into the water. We recovered it and hauled it onto the boat where we secured it on the deck. Someone remarked that they will never complain about paying taxes again! At first light, all hands still on deck, we fabricated a collision mat and crewman Christian dove under the boat to affix an epoxy and fiberglass patch to the crack, which we then covered with this collision mat. It was amazing to see the improvisation of this amazing crew, and the care taken to save Merrythought! We decided to proceed to Jamaica where there would be a facility to fully inspect and fix the boat seaworthy for the return to the USA. We had three pumps going 24 hours a day. 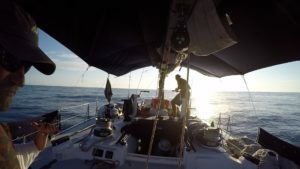 We sailed and motored at low speed the remaining distance, for almost three days, and arrived on the opposite side of Jamaica at Port Antonio – the race was supposed to end at Montego Bay on the other side of the island. After hoisting the boat out of the water on a huge derrick crane, we were not surprised to see the damage: bent hull plates, at least a foot of the keel stripped off and mangled, and the rudder shredded at the bottom. How this wonderful boat survived and brought us safely here to Jamaica is a miracle diffcult to comprehend, but very much appreciated. Unfortunately the boat damage is quite extensive. I do not see how it could be repaired in this short time to sail it back to the States next week. I am quite emotional about this experience as I write this, knowing how close we came to a tragic disaster with eight lives on board. The true implications are only hitting me now as I look out over this very beautiful harbor at Port Antonio, with Merrythought out of the water on slings attached to a huge crane. I suppose it is a bit of an aftershock as the reality only really sank into all of us just now, as we cried and held one another in a circle in a group hug. It is wonderful to be alive and having survived something this profoundly dangerous. Please know that I love you all. Please let’s remember how short and fragile life is. And please, let us continue to be a family like no other till I die. I also wanted you all to know that I received an email that Ria is back in intensive care in South Africa. They have signed a DNR (Do Not Resuscitate) order. I spoke with Nici and she said the bedsores create such infections that she became extremely ill again. Her heart is also beginning to fail and they suspect a blood clot in her lungs. Martie also sent an email and said it is not good. Katie, by the time you read this you will probably be in Vietnam, and I will be in South Africa. I wanted you to know that having just had this dramatic experience reaffirms for me one of my core beliefs: family comes first. I am staying in contact with Nici, and have arranged to leave the island on Sunday to go to South Africa. I will be back to meet you in Chicago on February 24 when you get back from Japan, Myanmar, and Vietnam. I will try to call you or Skype later today. Your loving father, Oupa, father in law, and your admiring husband. 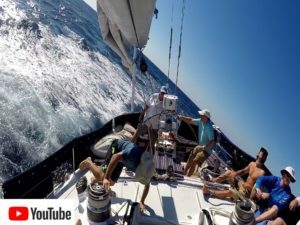 This video attempts to highlight the beauty of sailing a fantastic boat like Merrythought in challenging seas, while celebrating the courage of eight men who survived a near tragic event at sea, hundreds of miles from the nearest land. We limped into Port Antonio early in the morning on February 8, 2017 having nursed Merrythought gingerly through three days of beautiful seas, not sure what we would find. It was announced that we had retired from the race. After securing the boat on trestles in the Port Antonio harbor boatyard we hired a driver with a van to drive us across the island to Montego Bay. Mike had rented a villa there for us to stay the week of the race festivities at the Montego Bay Yacht Club after which we were to sail back to the U.S.
Mike and a couple crew members returned to Port Antonio the next day to start repairs on the boat. It became evident very quickly that repairs would not be completed in time for the planned sail back to the U.S. in one week. 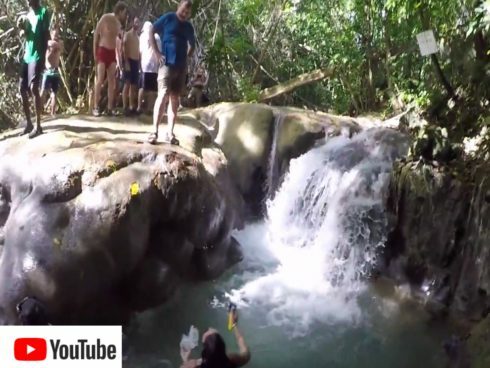 After a couple of days with my Merrythought crew friends, scuba diving with Christian, and taking a day-journey up the mountain to visit Mayfield Falls. I decided to fly back to Miami a couple of days later. I had received word that my sister, Ria, who had a stroke in October 2016 and was bed-ridden had been readmitted to the hospital where she was in critical condition. I traveled to South Africa via Atlanta and had a wonderful, although sad, visit with her, my niece Nici, and the rest of my South African family. I flew back in time for a client meeting in Sarasota on February 23, and then headed to Chicago for the weekend on February 24. Katie had spent the previous three weeks traveling in Japan, Myanmar and Vietnam, and I was anxious to see her, Jessica and Dan and Gavin and Lolly, with the wonder of this amazing, life-changing experience still so fresh. And I missed Thomas, Yuki, and Ryusei who Katie had just visited. I was looking forward to hearing their news. Having been on opposite sides of the world, I was also excited to hear about Katie’s journey in Myanmar. Mike was able to complete temporary repairs, including finding someone to weld an aluminum plate over the tear in the bow. 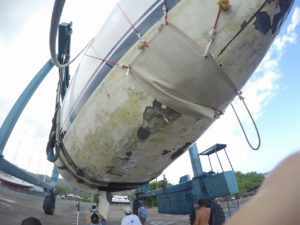 Unable to get a new keel and rudder shipped from the U.S. the damaged parts were sawed off, and a few weeks later he and a skeleton crew sailed the boat back. Merrythought was sold by the insurance company and I heard that she is somewhere up in Connecticut. Now, a year later, my sister Ria has made good progress and was able to move home. Still not ambulatory, she requires 24-hour care, but continues to have her old positive spirit even through this adversity. I wrote this blog to remind me of this life-changing experience juxtaposed with the fragility of life as I witnessed and remember the life-changing result that an unexpected occurrence such as our near-disastrous accident or Ria’s stroke produce. May we all remember how short life is, live life to the fullest each day, keep our families first and foremost in our thoughts and deeds, and help take care of those who are less fortunate than we are. 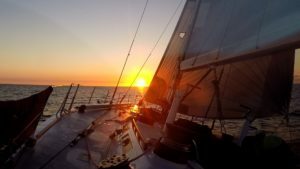 This entry was posted in Sailing Adventures on February 17, 2018 by wgrove. 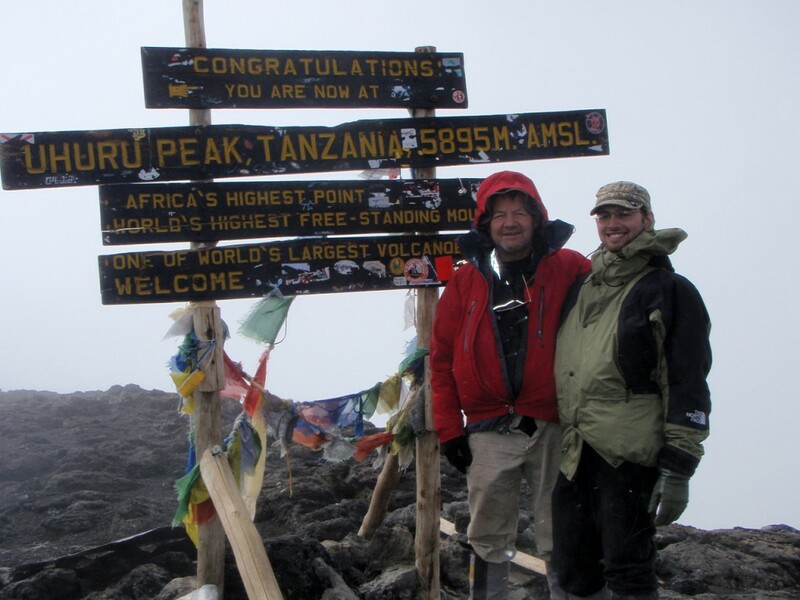 Thomas and Yuki – about 1,000 feet from Uhuru Peak, the summit of Kilimanjaro, 1-9,340 ft. It was a long journey from the time my friend, Richard Wallace, and I decided we would climb Kilimanjaro. Along the way we were joined by eight more, and I was particularly pleased that my son, Thomas, and his wife, Yuki, were able to share in this adventure. These photos are from the coffee table book telling the story of these ten adventurers climbing the world’s largest freestanding mountain, the highest peak in Africa. 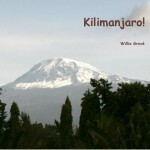 Click_on_the_image_above_to preview a copy of my book, Kilimanjaro! Click on the photo below to be directed to the video. 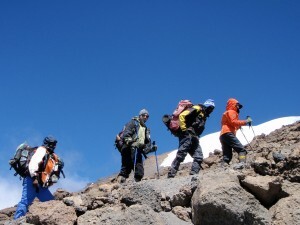 Uhuru Peak – Highest summit in Africa: 19,340 ft. This entry was posted in Adventure Travel, Kilimanjaro 2008 and tagged Adventure, Kilimanjaro, Photos, Travel on January 12, 2009 by wgrove.